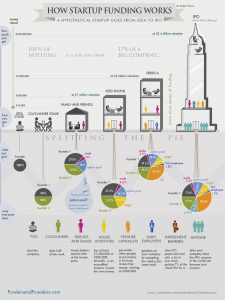 Today I stumbled upon a very cool infographic on FoundersandFunders.com: “How Funding Works – Splitting The Equity Pie With Investors“. After looking at the infographic and reading the text I wondered if this model also works for European startups. In my opinion there is no current economy or market created in Europe where Angel investors and early stage VC-firms have their (partial) Exit in the Series A round when a VC- or PE-firm invests. Yes we have Angel investors and VC firms, but they all need to invest in the companies for a much longer period of time. They need to be willing to be all-in, until the company they invested in, gets acquired or has an IPO. Maybe this is also the reason why European startups have a tendency to sell early? But that’s a good topic for another post. make shore you have added value for the founders, by beeing willing to be hands-on and help the founders in strategy and execution.